This article show the step by step to burn the ISO image from KNOPPIX live CD that downloaded to the computer. The KNOPPIX live CD usually come on the ISO (dot ISO)format (Usually you download in the ISO format), this is because the CD need to be bootable from the CD. In below example the KNOPIX ISO image ( KNOPPIX_V5.1.1CD-2007-01-04-EN.iso ) is burn using the Nero 6 CD / DVD burner. But before you burn the ISO Image please make time to check the integrity of the ISO image data. !. Clik on the Nero StartSmart icon to open the Nero 6. 2. 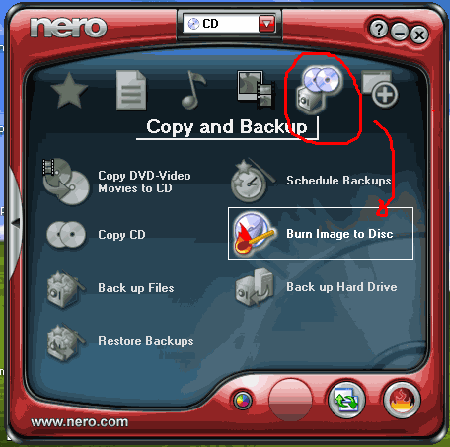 Find on Copy and Backup icon on the Nero window, -> then click on the Burn Image to Disc icon. 4. After you click on the Burn Image to Disc icon, the Open window is open. Browse the folder and locate the ISO image, then click on the ISO image. Click on Open button. 5. The Nero Express window should be open after you click on Open button, On this window click on the Next button. 6. Then then the next step is waiting for burning / writing process of the ISO image to the CD Rom complete. 7. Click finish button after the project completed. Keywords: burn iso, burn knoppix iso, burn iso image, burn bootable cd, make bootable cd, using nero to bun iso image, using nero burn iso, using nero 6. Submitted by cristian (not verified) on Sun, 12/18/2011 - 16:43.